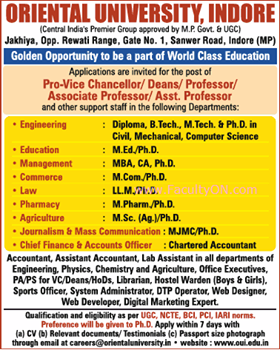 Oriental University, Indore has advertised in THE TIMES OF INDIA newspaper for the recruitment of Professor/Associate Professor/Assistant Professor jobs vacancies. Interested and eligible job aspirants are requested to apply with in 7 days. Check out further more details below. About College: “ORIENTAL GROUP” the most sought after name for quality education has one more feather in its cap. It has been given the University status under section 2f of UGC, 1956 Act with effect from May’2011. Having clinched the University status, the philosophy of Oriental University (OU) is to contribute in a broader sphere, thereby offering diverse courses in energy, civil aviation, refinery, environment, infrastructure sectors. The tenet with which Oriental University is marching forward is to develop responsible professionals who could be easily deployed in the industry. How to Apply: Interested and Eligible candidate may send your application form along with copy of certificates and passport size photo to following Postal Address or Email address with in 7 days from the date of advertisement.